If you’re wondering what to do in Chamonix, make your first port of call the Aiguille du Midi cable car to catch the finest view in Chamonix. Ascend to the dizzying height of 3842m via the Aiguille du Midi cable car, and then up a short elevator ride to the top. Freak your kids out (& yourselves!) by standing in the Mont Blanc glass box suspended over a horrifying 1000m. What’s not to love? Not only that. The 360 degree panoramic views over the French, Swiss & Italian Alps are stunning. Plus it’s the closest you can get to the jewel in the crown, Mont Blanc, without strapping on crampons, wielding an ice axe & hiring a guide. 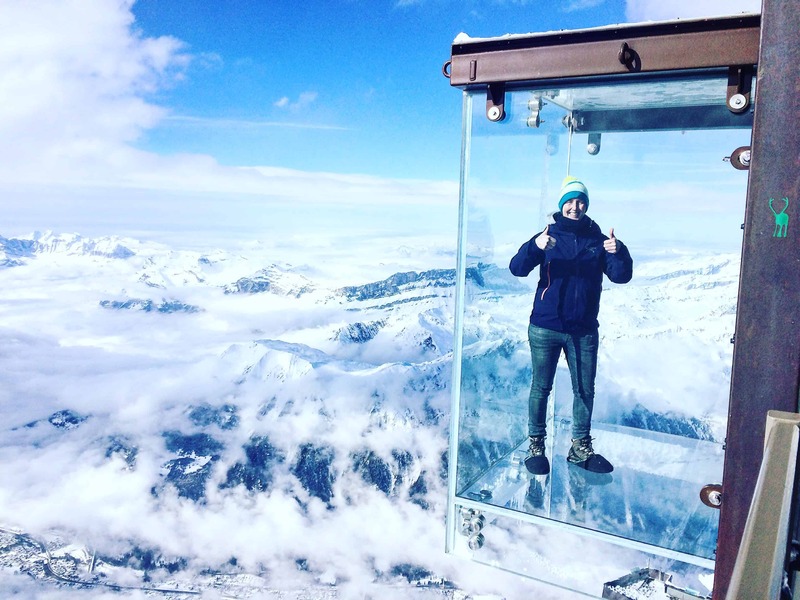 A ride up the Aiguille du Midi is definitely a go go for families who love adventure, and this glass box is a huge new draw to one of the most popular Chamonix attractions. Another great attraction in Chamonix is the Montenver Railway to visit the Mer de Glace. You can read our post here. This iconic cable car leaves from the centre of Chamonix and takes a mere 20 minutes to ascend to it’s mighty height of 3842 metres. Holding the world record for the highest vertical ascent: 2807m (from 1035m to 3842m) this is seriously high altitude and is not suitable for children under 3 years old. There are two sections of cable car journey. The first whisks you up to the mid-station, Plan de l’Aiguille (2317m) and its possible just to get a ticket to just this point, rather than the whole way if heights aren’t your thing. In Summer this is where you exit to access some fantastic hikes. You can also often watch experienced skiers, snowboarders or paragliders take off from here. Shuffle in line and then take the second cable car up over the Pelerin glacier and up the sheer North face slab of the Aiguille du Midi. The second cable car docks into a James Bond villain type lair clinging to the rocky precipice. It’s an engineering masterpiece that will impress. Built in 1955 the photos of it’s construction are fascinating. Like a scene from James Bond – the Aiguille du Midi station clinging to the sheer rock face is just like a villain’s lair! At the top visitors can dine in a panoramic restaurant, visit various viewing platforms & go through the ice tunnel to watch mountaineers set off on their adventures. In Summer you can take a truly spectacular journey from the Aiguille du Midi to Pointe Helbronner (3,462m) in Italy via the 5km long Vallée Blanche Cable Car. The peak to peak cable car spans across the Geant glacier affording incredible views of the seracs and crevasses, at points only 300 metres below. (It’s then possible to catch the Skyway Monte Bianco, to the village of La Palud near the Italian town of Courmayeur in the Aosta Valley. One of the first things you’ll see after exiting the cable car is a bridge connecting the structures built into the two jagged peaks. Vertigo sufferers may indeed suffer here. Look down into the abyss and wonder in awe at how the hell they built this thing! 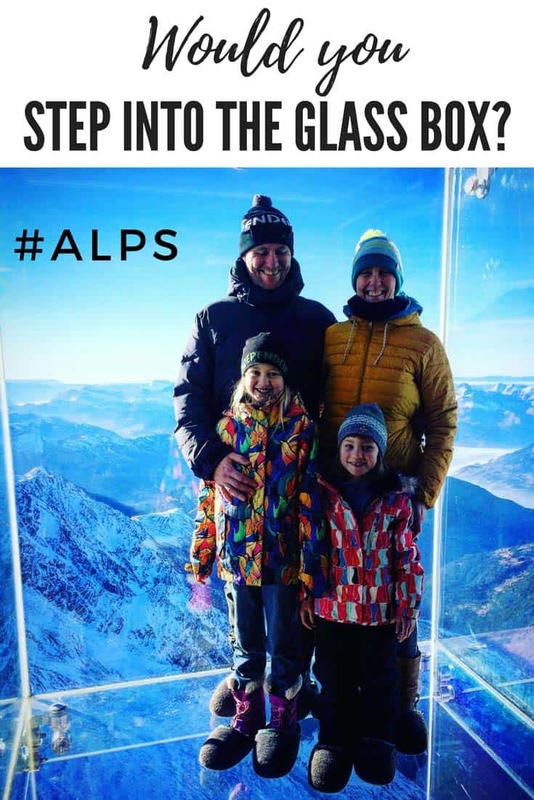 It can take between 2-3 hours to tour the top so if you’re visiting with young kids don’t go gunning for the glass Mont Blanc box straight from the cable car. Savour this for later! Kids get bored with sightseeing, even with such breathtaking vistas. The bridge with it’s scare factor is a winner. After this go past the elevator and climb the stairs to the right to the viewing terrace. Wrap up warmly – even in Summer! Here you’ll find panoramic binoculars which are fun for the kids to use and allow you to zoom into the white scene scape. 1 euro gets you about 5 minutes. From here, due South, you can view Mont Blanc, the White Mountain, or Monti Bianco as the Italians call her. At 4809m she’s the highest mountain in Europe. Watching over the Chamonix valley, she affectionately dominates the skyline for Chamoniards & tourists daily and is a massive tourist attraction, topping Chamonix sightseeing. The top of Europe – Mont Blanc! Cast your gaze North East down onto the long icy arête which thousands of skiers every season teeter across to start the most famous off piste ski run in the world – the Vallée Blanche. I’ve done it several times in my youth. Looking at it today with my kids by my side my gusto feels as gigantic as a pea. I make a mental note to tackle it again this season at some point. The truth is, the arête is the hardest part. After that its plain sailing as long as you don’t fall in a crevasse – that’s why you take a guide. The Vallée Blanche is not technically hard – you just have to have the balls to cross that arête with 1000m drops on either side. The vistas are simply magical up here. White soft curves, jagged broken peaks and strong sunshine throw contrasting shadows. Sheer natural beauty.The ‘tube’ (below) is a new addition to the Midi. The 32m steel tunnel allows tourists to access a new viewing platform around the main piton (spike). From here look across at the main villain building and down at the cable car from Chamonix. I love the rhino horn rock formation above. After the main viewing platform and the ‘tube’ we catch the elevator a further 42m up to the upper viewing platform – the highest you can go. Look up when you’re in the lift to see the passage through the rock through the lift window. The must have photo! 3842m above sea level! Here you can queue up for the the ‘Step into the Void’ glass box experience. There’s nothing extra to pay as it’s included in the cable car ticket fee. There was a short wait of around 25 minutes while we were there but the waiting area is heated and out of the wind so it’s a good opportunity to warm up. The Aiguille du Midi weather is never predictable and always much chillier than you think – wrap up warm and take a coat, gloves and scarf, even in Summer. To look down or not look down? We opted for NOT looking down until we were stood on it – just in case. The queue atmosphere was upbeat with anticipation with the main interest checking out the ‘mouffles’ (slippers) that each user are asked to wear to prevent scratching the glass. Our girls were captivated by the equipment that one member of staff was deftly using to move different sized slippers into range for users approaching the front of the queue. The slipper picker-upper, a rod with a pincer like movement (not unlike a litter picker rod) was used to prevent multiple bend downs to pick up slippers to give to new users. Fascinated by this, the queue time shrunk into mere minutes and we were shown our way into the glass box before we knew it. The staff operating the experience were fantastic, happily taking a multitude of photos of each visitor in turn. We were lucky with the short queue on our visit to the Mont Blanc glass box. I have heard of long queues so I would definitely recommend visiting first thing before the queues start. Opening times vary, so check ahead before going. TOP TIP: After the staff have taken a raft of photos of you standing in the void, ask them ever so nicely if they could open the exit door (less than 1 metre away) and take a snap of you from outside of the cube. How cool would that photo be? Well worth the ask my friend. Something I will definitely do next time. The ‘Step into the Void’ glass box resembles a glass elevator. Next make your way back down the elevator and to the ice tunnel, the exit/entrance for the famous Vallée Blanche. Peer over at the notoriously intimidating ridge line for the Vallée Blanche. Don’t worry, if you sign up for this once in a lifetime experience, your guide comes with years of experience, crampons & ice axes. In the ice tunnel! It was freezing! By now we’ve been up at this high altitude for a couple of hours and smiles are waning as the cold begins to bite. Our number one tip is to WRAP UP WARMLY. Even in the Summer temperatures up here can plummet to -10 so be prepared. Sun cream and sunglasses are also a must. There’s also a great exhibition up there on mountaineering and adventure sports that take place from the Midi. Action packed film clips with mind boggling feats of dare devil-ness repeat on a loop. The captivating footage show bat suits dare devils fly from the Aiguille or outrageous feats of bravery from slack line walkers balancing between two peaks. Your heart will skip a beat. Whilst we would have loved to have stayed longer to absorb this fab exhibition, our girls were beat and it was time to head home and descend back through the seracs, Chamonix bound. We would definitely recommend this day trip to families visiting Chamonix. The new ‘Step into the Void’ Mont Blanc box is definitely a winner for kids. Plus the woo factor of the pendulum swing of the cable car’s return descent over the pylons will leave them with a smile on their face. A must do day out whilst visiting Chamonix. Children under 3 are not permitted up to the top because of the high altitude. Children under 2 are not permitted to the mid-station. Elderly people have access up to the mid-station unless doctors have advised against such high altitude activities. The air is much thinner at altitude so breathing can be an issue for some people. Be mindful of this if you are elderly or suffer from heart or breathing problems. Whilst you may not notice it initially, after an hour or so at that altitude, you can begin to feel a little lightheaded, so take it easy and don’t rush. Breathing apparatus is available in medical emergencies. Wow just reading this Blog while I’m here in Chamonix on my own without my family. My children would be blown away going in the cube void. Its certainly one way too look at the views of the Mountain in a very safe way with wild children. Great idea!! Thanks so much Vanessa for your comments. YES! The Stepping into the Void cube is so safe for kids and certainly a thrill. The staff are also so great at getting nervous visitors or children to step over their fears and onto the glass! My tip is to visit first thing to avoid the queues. Thanks for reading our blog. Wow, the views are incredible. That box/cube looks cool, but I think I’d be a little scared! What a fabulous adventure including the Ice tunnel and Vallée Blanche. Cheers to your kids for embracing the adventures. This is really a wonderful experience. The glass box that takes you up and close to Mont Blanc is indeed stunning. The views of the snow-clad mountains stretching out all around you are really stunning. What an incredible feat of engineering. As you have mentioned reminds one of a James Bond thriller. The place also reminded me of Jungfraujoch in Switzerland. Hope to get to Chamonix and take in those stunning views. Looks like you guys are having a fabulous time! lots of adventures up, down and inside the great Alps! Not jealous at all!